Neckties are great, but bow ties are even better! 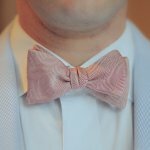 People, who adore bow ties, annually celebrate National Bow Tie Day on August 28. Today all men should pay tribute to this extremely important part of men's fashion.